The Main gate of the Iolani Palace, Honolulu, Hawaii. It was on this day in 1898, that President William McKinley signed the Newlands Resolution, formally annexing the Republic of Hawaii to the United States. How on earth, one may ask, did the United States come to subsume an independent republic into its territory? 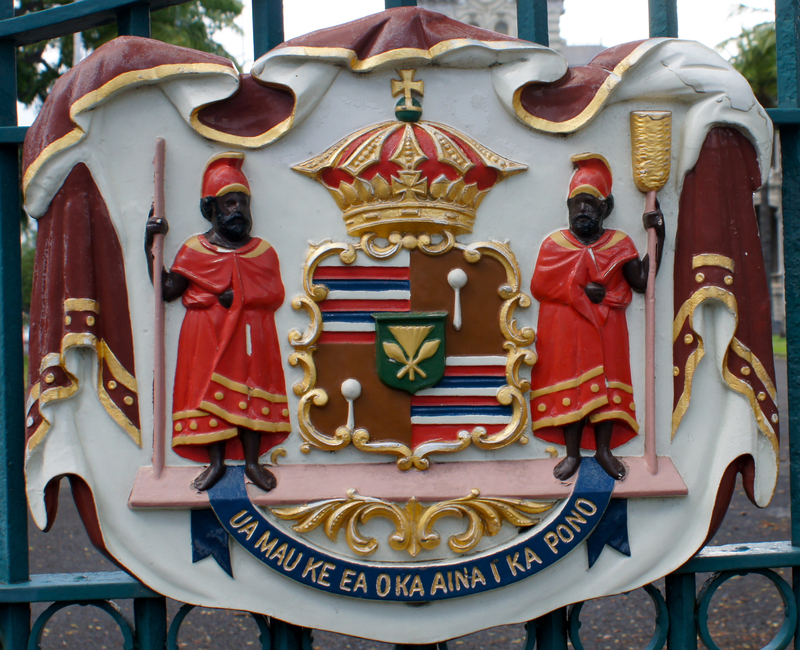 And, if Hawaii really was a republic, why is the place still so plainly attached to its erstwhile monarchy? As with most such situations, the answer is complex, bordering on the Byzantine. From the unification of the islands into the Kingdom of Hawaii under Kamehameha I, “The Great,” in the late 18th Century until the overthrow of Hawaii’s last monarch, Queen Liliuokalani in 1893, Hawaii was a functioning and recognized, independent Kingdom. Its independence had been compromised in 1843 when Royal Navy Captain George Paulet demanded under threat of force that the Kingdom be ceded to Great Britain. Paulet was evidently not acting under orders. Official protests were lodged against this action by the monarchy, by France, and by The United States. Soon, Whitehall repudiated his action, and Hawaiian sovereignty was restored within six months. (It is also possible that Paulet’s action was simply a “testing of the waters” by The Foreign Office to see if objections would be raised by other Powers.) Though the Kingdom of Hawaii could not hope to stand up to the military might of any Western Power, it was protected by a simple aspect of political reality: as long as none of the Great Powers with interests in the Pacific would permit another one to gain an advantage, Hawaii’s independence was essentially assured. It is also important to note that for most of the 19th Century, Hawaii was not an especially valuable territory from the perspectives of geopolitical concerns. Hawaii was extremely remote, and was not on the major Pacific trade routes used by sailing vessels (there is a reason it was not “discovered” until the late 18th Century, though the Pacific had been crossed and recrossed by European vessels for generations prior.) Hawaii was indeed a large and fertile land, and the islands did make a good whaling station (humpback whales congregate in the warm waters to breed each Winter) but it had few items of export value other than some native hardwoods. Hawaii was of greater interest to missionaries striving to save souls than to politicians maneuvering to gain global advantage. The situation changed irevocably on 9 March 1862 with the first military clash of completely steam propelled, iron-clad warships at Hampton Roads, Virginia during the American Civil War. Almost literally “overnight,” wooden navies powered by wind and sail were rendered obsolete. The age of iron, steel, and steam had arrived, and with it the need for coaling stations across the globe. Nineteenth Century steamships burned coal. Lots of coal. And without a readily available coal supply, a navy’s ability to project its power was severely limited. In the last decades of the 19th Century, island after island – no matter how remote or small or barren or otherwise unprofitable – was taken over by one of the Western Powers, mainly to serve as coal and supply depots. Suddenly, remote Hawaii was viewed in an entirely new light. In the days of sail, Hawaii made a useful watering and supply stop for whalers, but offered no significant strategic appeal; in the days of coal, Hawaii was perfectly located to permit a steam-powered navy to project its power across a vast region of the Pacific. Technological change had rendered Hawaii far too strategically valuable to remain independent for long. The United States, owing to its large resident population of missionaries and their descendents in Hawaii, enjoyed a strong commercial relationship with the Kingdom. Plantation crops had been developed for foreign trade, and by the 1870s, Hawaii supplied a huge volume of sugar to the U.S. at favorable rates. The Kingdom of Hawaii also retained close ties to Great Britain (as reflected in the odd fact that the State of Hawaii’s flag incorporates the “Union Jack” of Great Britain!) Many in Hawaii felt that it was inevitable that it would become a formal protectorate of one or the other of these nations. By the late 1800s, though, with the rise of a unified Germany, an increasingly powerful Russia, and a rapidly modernizing Japan, there was simply no possibility that Great Britain would be allowed to formally extend its hegemony over so strategic a posession. No European Power wished to see Hawaii added to the British Empire. Similarly, it was unacceptable to established Powers that an “upstart” Japan should be allowed to commence building a Pan-Pacific Empire. It was equally unthinkable Hawaii should remain independent, playing one Power off another. supported by the population, it was deeply unpopular. At the time that Sanford B. Dole’s “Committee of Safety” with the aid of United States Marines dispatched by U.S. Consul John L. Stevens, imprisoned Queen Liliuokalani and declared the monarchy abolished in 1893, the majority of Hawaiians had no desire to see the monarchy ended. In fact, majority sentiment favored a re-empowered monarchy, the possibility of which led to Dole’s coup. Dole and his oligarchy hoped to have the United States annex Hawaii immediately after the overthrow, confident that expansionist president Benjamin Harrison would favor such a step. However, Harrison lost his bid for reelection and president Grover Cleveland would not even consider such an annexation. The U.S. House of Representatives issued a resolution deploring the use of U.S. troops to overthrow a legitimate government, and Congress would not take any steps toward taking control of Hawaii. The Committee of Safety therefore declared the Republic of Hawaii on 4 July 1894 with Sanford B. Dole as president. (Hawaii is one of only four states to have been an independent republic.) The republic bided its time until the United States elections of 1896 returned the Republican Party to power, and after the inauguration of William McKinley in March 1897, Dole commenced negotiations for annexation. Hawaii was formally annexed in 1898 and became a U.S. territory in 1901. Dole served as the first territorial governor.